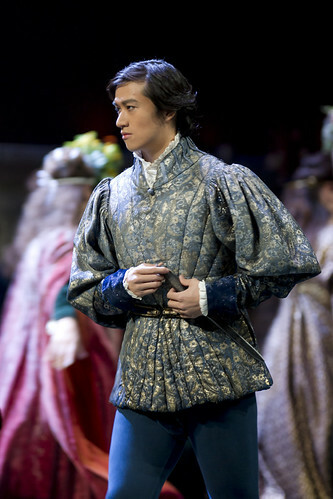 Chinese baritone ZhengZhong Zhou (周正中) was a member of the Jette Parker Young Artists Programme 2010–12, singing such roles as Marullo (Rigoletto), Paris (Roméo et Juliette), Sciarrone (Tosca), Prince Yamadori (Madama Butterfly), Valentin (Faust), Gelsomino and Zefirino (Il viaggio a Reims, Jette Parker Young Artists Anniversary Concert) and Des Grieux (Le Portrait de Manon, Meet the Young Artists Week 2011, recorded for Opera Rara). He created the role of Runner in the world premiere of Anna Nicole. In the 2016/17 Season he returns to sing Ping (Turandot). Zhou studied at Shanghai Conservatory of Music and the Centre national d’insertion professionelle d’artistes lyriques in Marseilles. Since leaving The Royal Opera he has worked with the Deutsche Oper Berlin as an ensemble member, his roles including Moralès (Carmen), Fiorello (Il barbiere di Siviglia) and Marquis d’Obigny (La traviata). Engagements elsewhere include Count Almaviva (Le nozze di Figaro) in Beijing, Marcello (La bohème) for Raymond Gubbay at the Royal Albert Hall, Valentin for Hong Kong Opera, Sir Riccardo Forth (I puritani) for the Teatro Municipal, Santiago, Silvio (Pagliacci) for Opéra de Monte-Carlo and Flemish Deputy (Don Carlo) and Prosdocimo (Il turco in Italia) for Théâtre du Capitole de Toulouse. Zhou has performed in concert at the Beijing Music Festival as Balstrode (Peter Grimes), with L’Orchestre Régionale Cannes PCA and in recital in Avignon, Marseilles, Toulon and Paris.